STOLEN: FOUR SCOTTISH CHILDREN. Docherty Interviews & Transcript – WHERE IS THE OUTRAGE? Janice & Brian Docherty’s four kids were STOLEN from them. They haven’t seen their children for OVER SIX MONTHS (when published on Aug 20, 2016) to date, 8th Feb 2017, they STILL haven’t been “allowed” to see their children. It’s been an ENTIRE YEAR! David Scott (UK Column) joins Kev & John to discuss the case of The Docherty family vs The State. Imagine reporting a crime & then being put in the crosshairs of the people that you thought would protect you? That what happened in Scotland to Janice & Brian Docherty. They are at the centre of a story so surreal it will have your head spinning. 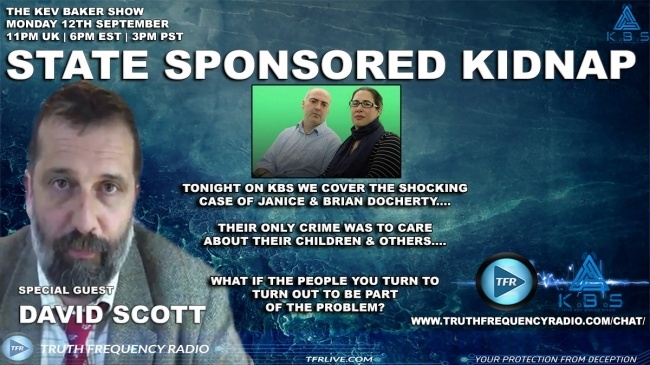 From state surveillance to constant harassment, false allegations & fraudulent reports, all leading to the eventual seizure of their children by the state that they thought would protect them. We NEED to stop this, first & foremost for the sake of the four Docherty children. But for ALL OUR CHILDREN. If we don’t stand up & fight for the Docherty kids then we are actively GIVING the establishment a free reign to do whatever they like wi our bairns. And whose children are next? Yours? Mine? Your nieces? My nephews? Because if we let this happen THERE WILL BE A NEXT TIME and a time after that and a time after that. How many of our children is it gonna take? WHEN IS ENOUGH REALLY GONNA BE ENOUGH? Report a paedo & lose your children. Punished for reporting a nonce .